Variable-frequency drive for an automatic control of organ motor speed and torque - hmh-shops Webseite! Balancing noise, heat, motor insulation stress and power consumption! The variable-frequency drive adapts motor to the load. It generates variable frequencies and voltages, saves energy and minimises wear and tear of the equipment. 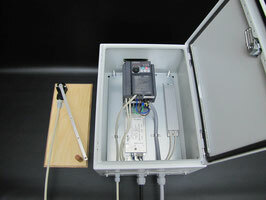 A sensors connected to bellows board controls the variable-frequency drive. If the bellows board is in the lower position, the driving motor accelerates according to accelerating curve set. During the upward movements of the bellows board the motor speed is continuously slowed down. As soon as airflow begins and the bellows board moves down, the variable-frequency drive sets the motor speed higher so that there is enough air available in the bellows. The variable-frequency drive replaces curtain valve. This allows avoiding noise caused by curtain valve and its maintenance. Our variable-frequency drive can only be used with a thee-phase motor. The variable-frequency drive pre-set for the blower and delivered with EMC filter, brake resistor and shielded motor cable in a compact case. 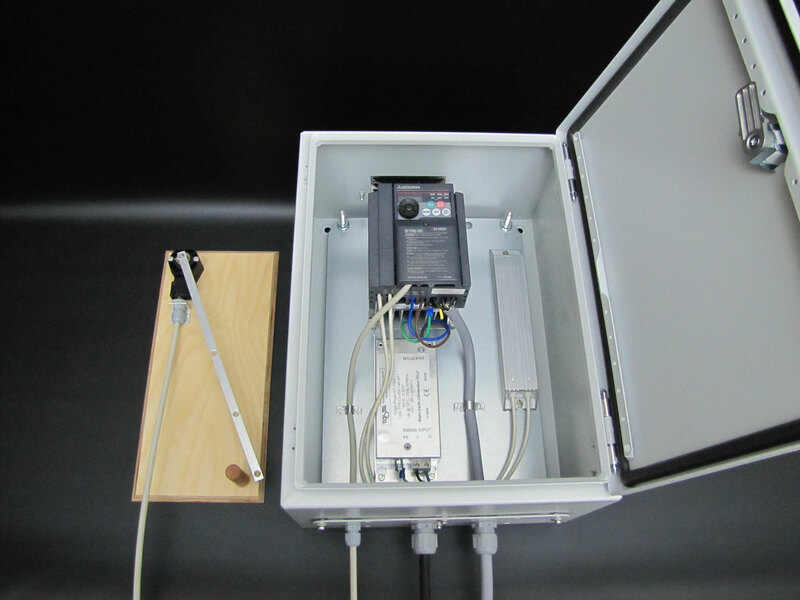 The variable-frequency drive and the sensor unit are designed to be installed in a vertical position. All components are pre-assembled and ready to be quickly installed on site. The control lever connected to the sensor shall be tied to the bellows board with a string, so that the control lever rests on the end stop when the motor is turned off and the bellows board is in the lower position. Regarding different local conditions, a connecting string is not included in delivery. The installation location should be taken into consideration when assembling variable-frequency drive with power above 0.76 kW. Such devices have a slightly buzzing fan. The table below shows common power ranges of variable-frequency drive. We have tested different motor sizes of variable-frequency drives supplied with three-phase electric power an the following types have shown the best results. For further information (e.g. variable-frequency drives with supply voltage of 230 V producing three-phase electric power, variable-frequency drive for alternating current) please contact us!